As a leading supplier of industrial service diesel engines, we are committed to providing the largest stocked inventory of parts, engines, kits and filters on the West Coast. Our team of parts experts is knowledgeable and among the best in the industry. Our shipping is fast – count on receiving your part within 72 hours. The cooling system is vital in keeping your Perkins engine running at optimum temperature and preventing engines from overheating and breaking down. Running too hot means the engine is in danger of overheating, resulting in damage to internal components. Our cooling system components include genuine Perkins coolant relief valves, fan belts, pulleys, radiator systems, thermostats and water pumps. Your vehicle’s most critical system involves the cylinder head and block, pistons, rings, connecting rods, flywheels, crank and camshaft. Every part of the engine is produced to exacting tolerances by Perkins. The difference between genuine and non-genuine parts may be small, but the risks of using non-genuine parts can be significant. The good news is Perkins Pacific has the largest availability of both new and reman Perkins engine cores in North America. We also offer genuine Perkins motor oil and lubricants. Your engine’s effectiveness and dependability are reliant on its starting and charging systems being in top condition. 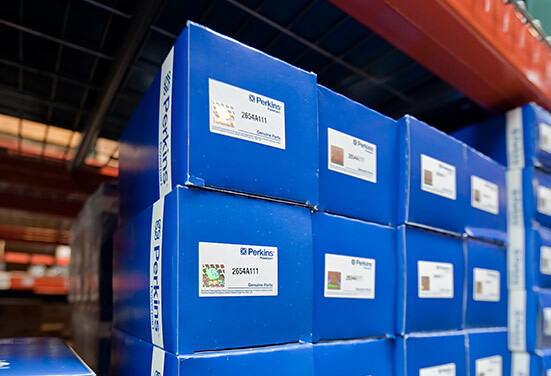 Purchasing genuine Perkins electrical parts like alternators, control modules, glow and spark plugs, sensors, solenoids, and start motors ensures your Perkins product maintains correct specifications and will deliver optimum power and confidence. Our genuine Perkins fuel systems are thoroughly tested for tens of thousands of hours to ensure the system performs at peak performance and meets emissions standards. We supply Perkins fuel pumps, injectors and nozzles. Although small, seals are a critical component to operation of your engine. A properly-functioning and fitting seal helps retain engine oil and prevent contaminants from entering the engine, which could result in larger problems down the road. Reusing old gaskets can result in a poor seal, increasing the possibility of leakage. Our Perkins genuine parts supply includes air system gasket and seals, auxiliary drive gasket and seals, and Perkins cooling system gasket and seals. The amount and pressure of air in your engine is just as critical as the fuel you use. A turbocharger can produce 40 percent more energy than a naturally aspirated engine of the same configuration. Fuel economy of diesel engines can also be improved. Our Perkins replacement turbochargers are an easy solution to get your equipment back up and running as quickly as possible. Genuine Perkins intercoolers, which cool and increase the density of the air supplied by the turbocharger, are also available. Filters trap soot, ash, and other particulates, and can have serious consequences reducing the efficiency and effectiveness of your engine if it doesn’t receive regular attention. Ultimately, if the filter fails, the particulates it has been trapping will enter the engine, resulting in costs from damage that greatly exceed the savings of not changing the filtration. Genuine Perkins filters, including air filters, fuel filters, oil filters, Perkins breathers, and Diesel Particulate Filters (DPFs), are covered by a 12-month warranty. We also carry Donaldson Filters. Our genuine Perkins hardware includes everything from gas and radiator caps to dipsticks. Engine oils, coolants, and cleaning and conditioning fluids are also vital to your equipment’s life. Change the fluid often and use formulas designed specifically for your equipment to help extend its life and performance. Perkins Pacific supplies genuine fluids, hardware and consumables for your vehicles.